Learn how to knot the double overhand knot. This is a bulkier knot than the single overhand knot. This knot is good for beads that have larger holes. 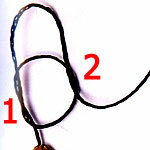 It is one of the easiest ways of placing safety knots between beads. With single overhand knot, you need to allow at least 2½ times or more of your desired finished length. With this knot, you will need quite a bit more thread so make sure you give yourself lots of spare thread. 2) Slide & Tighten: Put a strong, blunt needle into the knot. 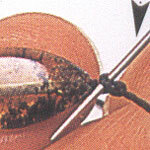 Use the needle to slide the knot back towards the bead. Tighten the knot and remove the needle as you tighten. 3) Continue this way - string a bead & make a knot between each bead. Keep spacing and tension even by sliding the each knot with the needle.